I didn’t know how to make zoodles (zucchini noodles) until today. I am wondering what took me so long. Last year, I wrote about grating zucchini into pasta in a pasta and zucchini recipe and I used a box grater. 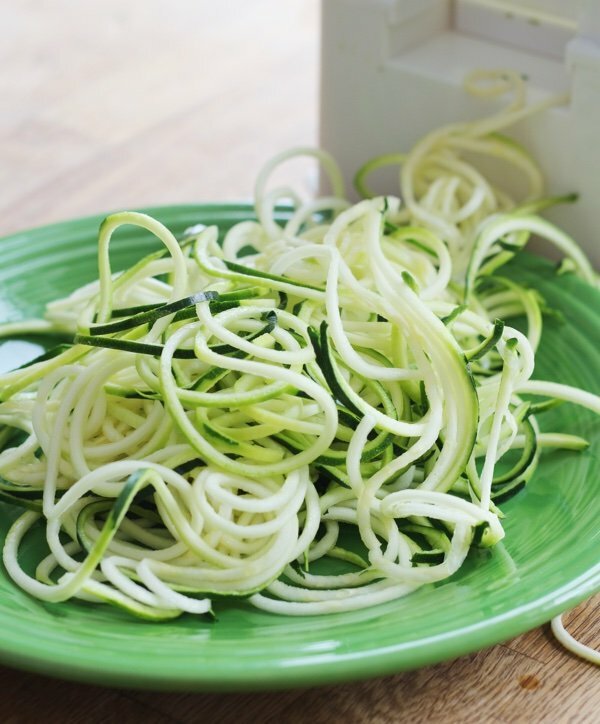 Many commenters told me to get it together and use a spiralizer to make zucchini noodles. I also sliced zucchini for my baked zucchini lasagna. 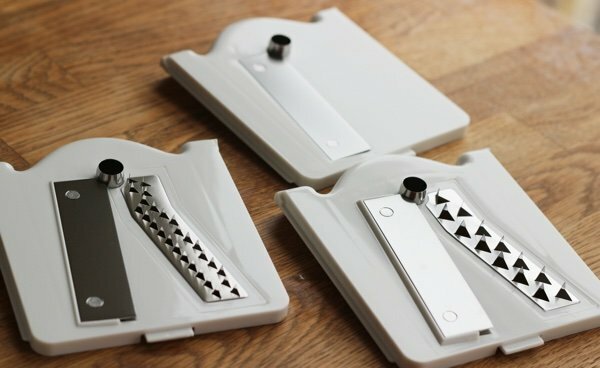 I hate getting a new thing for the kitchen because I have nowhere to put it but I decided to e-mail Paderno to get my hands on one of these slicers (see above). The concept – make low carb pasta with vegetables – is a REALLY good one. Anytime you can eat more vegetables, I am for it. My friend, Marj, has one of these but she says it is collecting dust in her cupboard. She used it, liked it, and then forgot about it. I am hoping I will love mine! It comes with three blades so that you can make different kinds of “noodles”. I was attempting the classic zoodle so I chose the one in with the small holes. 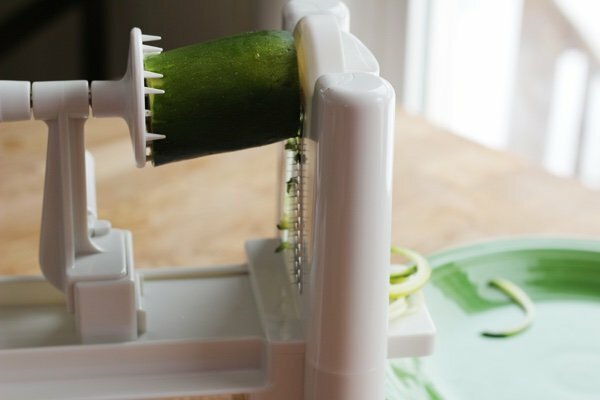 The instructions were easy to follow – slide in blade, attach comb to crank, attach zucchini to comb, and then spin it. Check it out! Zoodles! This was fast, simple, and (dare I say it) fun! I cranked along spitting them out until I finished one zucchini. I decided to use two large zucchinis (zoodled) for a simple recipe involving packaged pesto and chickpeas. See below for the recipe. I was in a hurry (as I frequently am) and didn’t want to invest too much in these zoodles in case they were terrible. 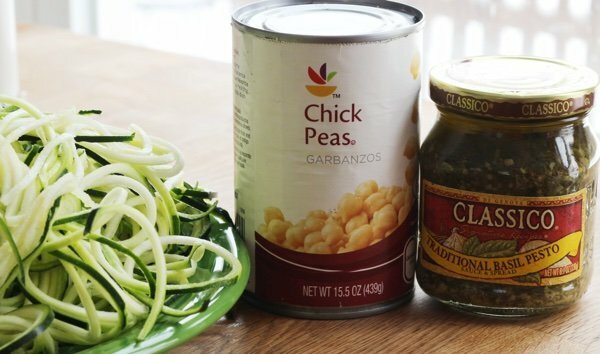 Are these zoodles like actual pasta? No. But, they are seriously good anyway. 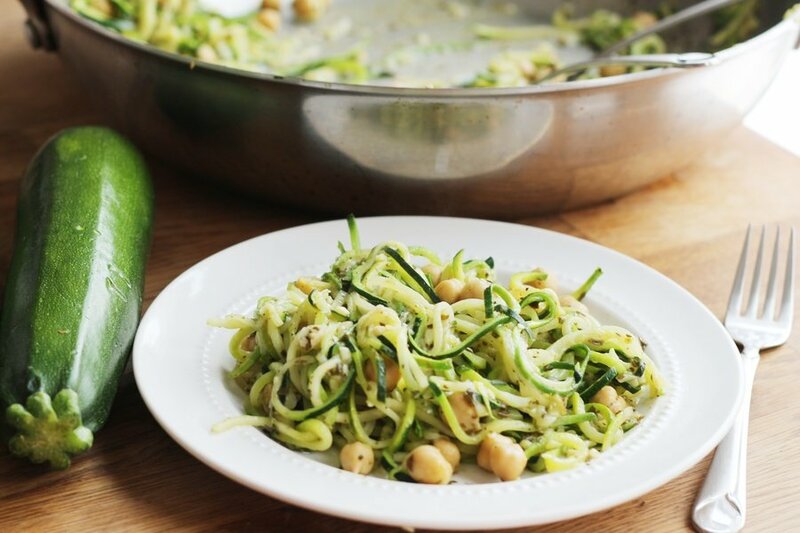 Forget about pasta and simply enjoy the zucchini. The shape allows them to pick up the pesto and the beans add a texture to break up the noodles. This was delicious and I was convinced I was going to hate them. Below, I have listed the best selling “Inspiralized” book. I haven’t read it but I hear it is good. I may save reviewing it for another day. You can read more about the Paderno Tri-Blade Spiralizer on Paderno's website. I think it worked well. 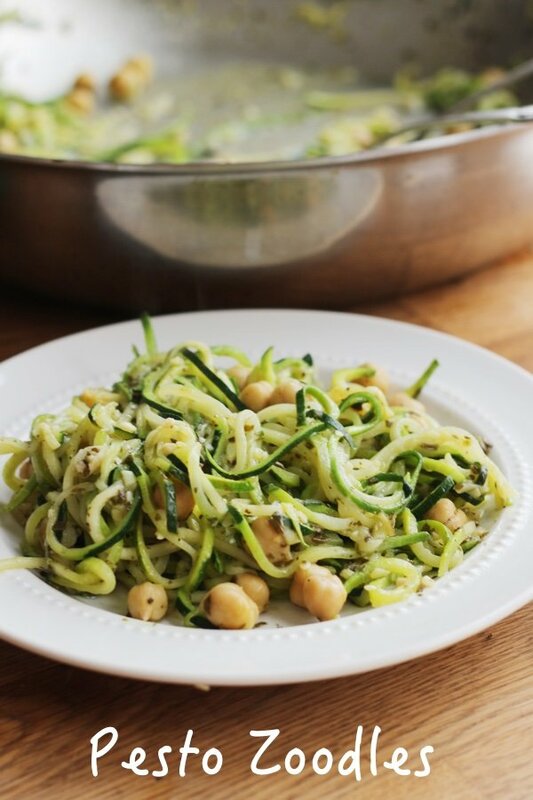 Have you tried zoodles? What did you think? This product was received for review consideration. No other compensation was provided. In a large skillet, heat pesto and beans for 2 minutes, stirring frequently. Add zucchini noodles and sauté for five minutes until zucchini is soft but still firm to the bite. Adjust with salt and pepper and serve immediately. I've been making "zoodles" for at least a couple of years and love them! I don't use recipes specifically for them. Rather, I replace pasta with them or use them in combination. It's surprising how many dishes you can tuck them into without a change in flavor. I'll use them with bolognese or go half and half. I keep an unsealed (so they don't get soggy) bag of zoodles in the fridge and they keep for several days. Use them in soups, lettuce wraps, casseroles. I think you'll be surprised how many favorite dishes can be lightened up with them. BTW, don't overcook them. If adding to a dish, I usually microwave them only long enough to heat - 30 seconds or so depending on the quantity. I used Veggetti to make zoodles, and they come out great. It's cheaper a less bulky. Don't want any more large gadgets in my kitchen! It actually comes with 5 blades. I got this as a Christmas present and on the box it said 5 blades but I only saw 3, as you showed. If you look at those 2 drawer like things on the slicer, you'll see that those can be pushed out by the tab on the back and you'll have 2 more blades for a total of 5. I used this for the first time this past weekend with my granddaughter and we had fun cooking the different shapes using different spices. Oops Sorry, I got the same slicer and it came with 5 blades. Just noticed that you have the Tri Blade one. Anyway, it worked great with zucchini. I'm going to try some other veggies this weekend. we have the spiralizer and veggeti. bought the veggeti first, and while all of the above statements are true, it does zucchini and cukes just fine. However if you have arthritis you will tire of using it even for the softest veggies. I have personally spiralized butternut squash and sweet potato with the Paderno. Although now it seems every grocery store has ready-cut veggie noodles. It is a great tool! Looks good, but I'd like to see some more recipes. I bought one, tried the noodles, but even with some spaghetti sauce, they tasted like eating grass. I gotta be doing something wrong. 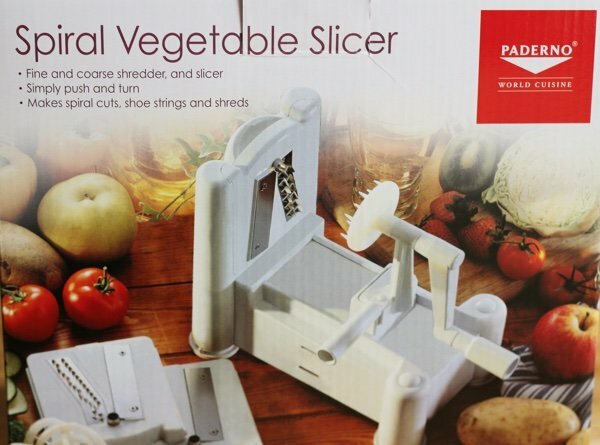 I can't wait to get this, i have been using the Veggetti for a long time and yes it is like a pencil sharpener and seems to be some waste, as much as all grocery stores do carry all vegetables spiraled or riced, you are paying double and in some instances triple for very little veggies. @Kevin -I was concerned they were going to taste like grass but the garlic, basil, olive oil combination was delicious with the zucchini. I am getting the Spiralized book and will test more recipes. Thanks for your comment!! I typically use my julienne gadget, as I've had absolutely no luck with the Veggetti. Has anyone used the spiralizer attachment for the Kitchen Aid mixer? Sweet potato noodles. The paderno cracked. It is made of plastic, just wish they made one out of a more durable material. I make a shrimp and noodle dish using half zoodles and half speghetti. My husband did not even notice the first time he ate this dish. I told him after it was half zoodles. He has asked me to make it several times since. I have been using a veggetti. I am thinking of getting the kitchenaid attachment for spiralizing vegetables. I have a kitchen aid attachment for spiralizer so I can just detach and stash when not using. I go in spurts but it is also fun for making apples into spirals for the kids. I often spiralize a zucchini and just add to the regular pasta for spaghetti/sauce -it is better received that way!